Constance Radcliffe was a great friend of Kathleen Faragher and they frequently performed together on the stage at Maughold W.I. meetings. In the 1950s and 60s Kathleen Faragher frequently wrote Manx dialect duologues for Constance Radcliffe and herself to perform as entertainment at the Maughold Women’s Institute meetings in the Dhoon and Maughold Church Halls. 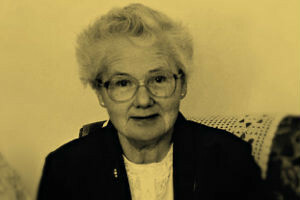 This recording of Constance Radcliffe was made at her home in Maughold in 1986.